Why crawl when you can fly? While their relatives slither on the ground, a few snakes take to the air, gliding from tree to tree. 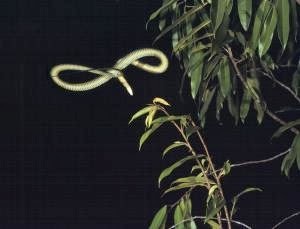 The most skilled of them all is the paradise tree snake, and we may finally have worked out why. It gets an aerodynamic lift by shifting its body into an unconventional, yet strangely familiar, form. There are five species of flying snake, all native to south-east Asia. The five are reasonably average in the looks department – at least, until they begin to move. These snakes slither up trees before launching themselves from branches high in the canopy, undulating their bodies from side to side as they glide elegantly – at speeds of about 10 metres per second – to their destination.